The 1908 built train carriages are conspicuously parked a few metres off the main drag of McLaren Vale. Both are beautifully restored and one has been converted into a shop that sells all manner of locally produced edibles, and the second is a quaint little cafe. Nestle in to one of the original train carriage bench seats with train racks above, and marvel at the lovingly stripped and polished timber floors and walls. 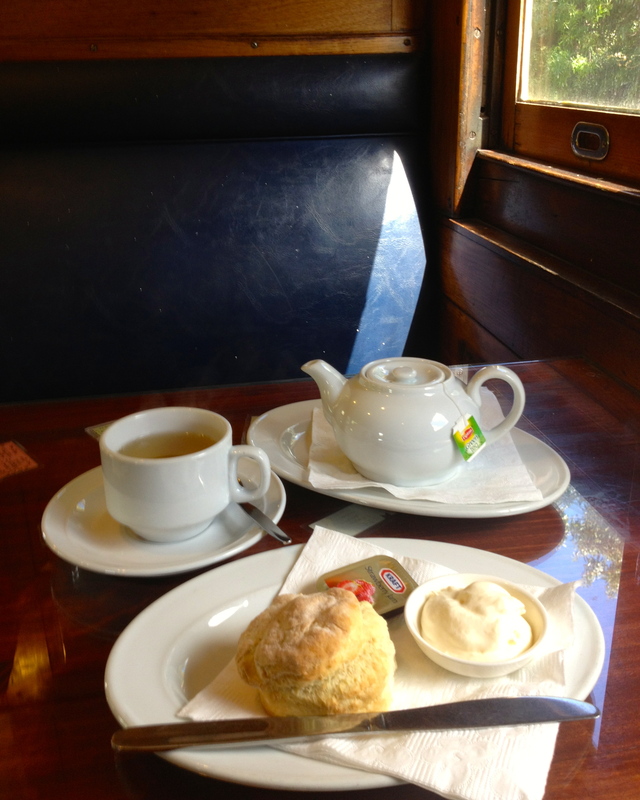 The cafe offers a ‘Devonshire Tea Deal’, which is one scone and a pot of tea, so a good option if you only want something light. I’d say it’s a great idea but I’m not impressed with the lousy portion controlled jam packet and the sweet and slightly chewy scone. I am glad however with the freshly whipped cream – a bonus – but not enough to make it a winner. Be sure to check out the wonderful train carriages though, and maybe try one of their 65 milkshake flavours! Tea: A small selection of tea bags served in the perfect sized pot. Overall: Step back in time and enjoy the wonderfully restored carriage.